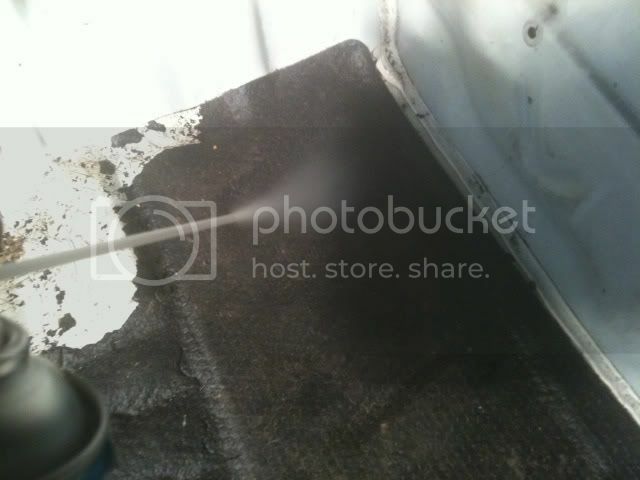 4GUK • View topic - How To - Remove Sound Deadening the Easy way. How To - Remove Sound Deadening the Easy way. Post subject: How To - Remove Sound Deadening the Easy way. This is my preferred method, using this method it doesnt matter if its mit winter or mid summer, should still be easy to remove! So, what you need, is a Hammer and some Pipe Freezing spray used for household plumbing. Take this spot for an example. What you want to do, is spray in small sections, i sprayed a section of about 8" by 8"
What you want to do then, is tape the section you have sprayed several times and evenly over the sprayed area. Now, just get a screwdriver and pry it off! it should come off in big sections and it shouldnt leave any debris. Now, the spray cost me £7 for that small can, i managed to do the Passengers footwell and half the rear section of the floorpan before it ran out. you can get bigger cans for cheaper, but i spent a couple of hours going around the local shops but this was all i could find in stock. If you don't tape it up, can't you just use a dustpan and brush, or hoover? Which ever way you want to, i got an old Dyson as the "Garage Hoover", so i pick up the big chunks with my hand then hoover whats left, job done! 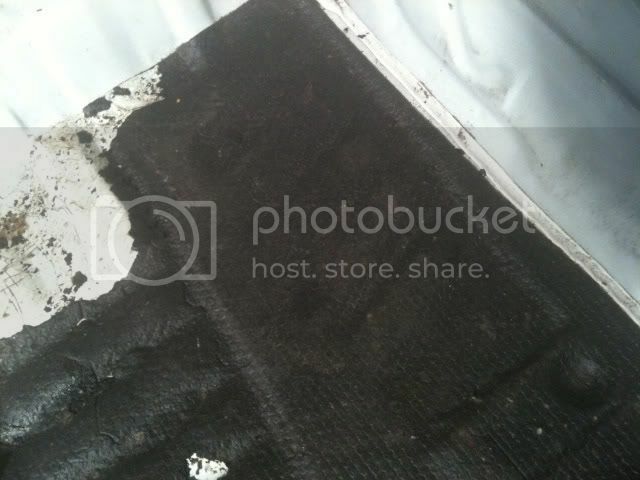 In the floorpan are several Bungs, theres 3 on each side, 1 small and 2 big bungs, the tar sort of welds itself to these when they put it on, so when you bring up the deadening, you will more than likely pull these bungs out (Like Round, metal embossed plates). ive kept mine and will re-place and reseal onces the floors done! Will definately be using this when im back. Far easier and cheaper way to do it is to do it when its below zero outside, the colder the better. 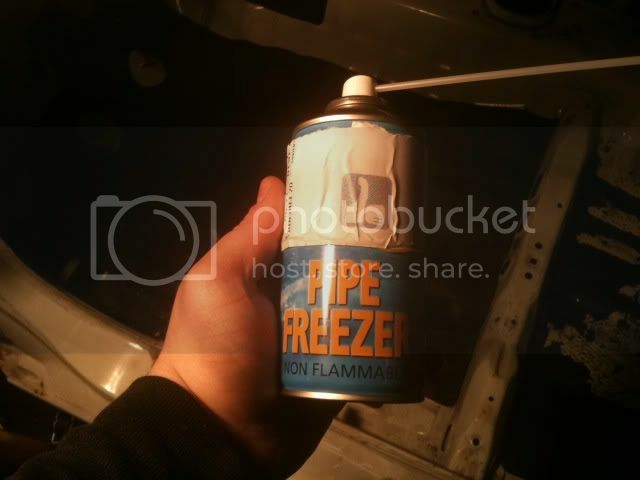 Best way IMO is definitly not a screwdriver as this could easily leave scratches in the paint (doesn't matter if you are re-spraying) the best way is to get it as cold as possible then hit it with a hammer (not too hard) it then tends to break away in big chunks. 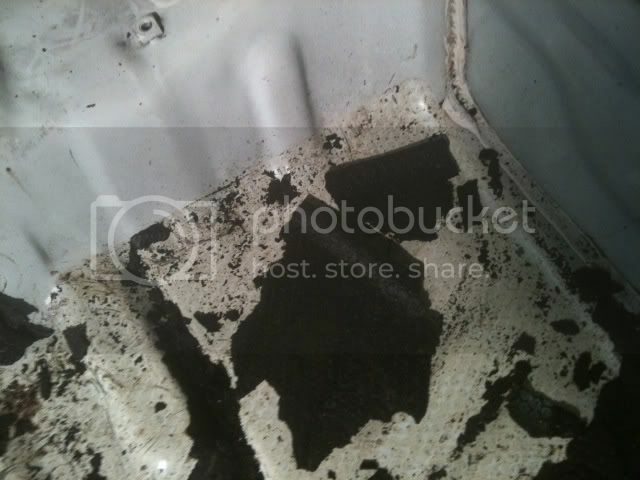 Post subject: Re: How To - Remove Sound Deadening the Easy way. wish i looked on here before i spent hours trying to get it out of my car. never mind hay live and learn.